Hover over the content where the link will be added. When prompted, click to edit. Highlight the text you want to link and click the Add/Edit Link icon. Link to: Select Website (http://) or Secure Website (https://). Link URL: Add the rest of the URL. Do not include http:// or https://. This field accepts URLs for both web pages and locations (e.g., Google Maps). Link Text: This field is automatically filled with the text you highlighted. Link Color: Make sure the color is #990000. 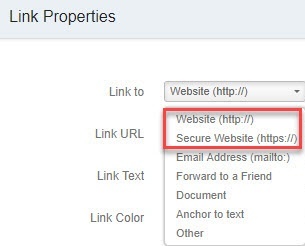 If you want underlined link text, check Include underline on hyperlink. Tracking Alias (optional): Enter a descriptive name that can be used for analytics. If desired, check Conversion Tracking Link. Title (optional): Enter a title; this will be the hover text. View the link in the email preview pane.